Ben Schlottman wins the 118th North & South Amateur. 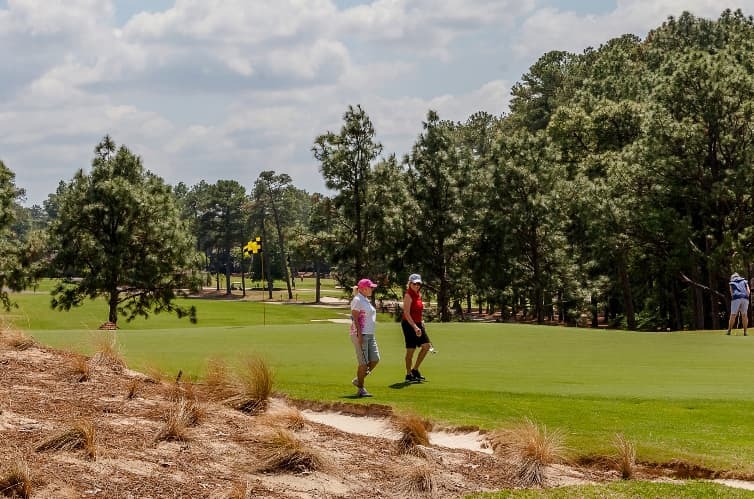 VILLAGE OF PINEHURST – Four days ago, Ben Schlottman stood in the 18th fairway of Pinehurst No. 2. He had a 6 iron in his hand and knew he needed a birdie just to make a playoff for a berth in match play of the 118th North & South Amateur. That 6 iron only got him to about 30 feet from the hole. But Schlottman made the long putt, punctuating the moment with a heavy and hard fist pump toward the cup. He made the playoff, then made it to match play as the second-to-last player in the field, and just continued to grind the rest of the week, never once falling behind an opponent by more than 1 down. Four days after he stood in the 18th fairway with that 6 iron, Schlottman found himself on the 11th green, holding his putter and staring at a 5-foot putt. And when he made that one, too, he again drove his fist toward the cup, let out a roar, and triumphantly completed a journey that almost never began by dispatching Mitchell Meissner 8&7 on Friday to win the North & South and claim the Putter Boy trophy. A veteran of numerous Donald Ross Junior Championships and North & South Junior events, Schlottman, who led Auburn to the NCAA Championship semifinals, had little trouble with Meissner on Pinehurst’s largest stage. Schlottman made a 40-foot birdie putt on the first hole, then recovered with a brilliant shot out of the bunker on the second to take a quick 2-up lead. Schlottman led by three holes after a par on the 6th and made a dazzling approach on the 7th from the native area left of the fairway to win that hole. Meissner missed the fairway well left on the 8th hole, and though he made a nice shot from there, the ball skidded over the green and left, leaving him with a near-impossible shot. Schlottman continued to collect pars and tally wins on each hole while Meissner’s struggles continued, and after his ball plugged in the bunker on the 9th, Meissner went to the 10th tee 6 down. The troubles only worsened from there. Schlottman found some of those spots, too, over the last couple of days, but was masterful throughout at scrambling. That he closed out Meissner after getting up-and-down from about 50 yards was apropos. The Men’s North & South Amateur Championship is the longest consecutively-running amateur golf championship in the United States. Over the past century, the best amateurs in the world have vied for its coveted Putter Boy trophy. The winners now serve as legends in the game – among them Walter Travis, Francis Ouimet, Jack Nicklaus, Curtis Strange and Davis Love III – and the championship continues to draw the best in amateur golf.